Kyloe Wood is situated on the Kyloe hills approximately six miles south of Berwick-upon-Tweed and two miles inland. It overlooks the Holy Island of Lindisfarne to the east and twelve miles inland to the south west are the Cheviot Hills. The wood came into the possession of C.J.Leyland of Leyland Cypress fame in 1900. Leyland was a retired sea captain who had travelled extensively and wanted to make Kyloe a repository for a collection of conifers. 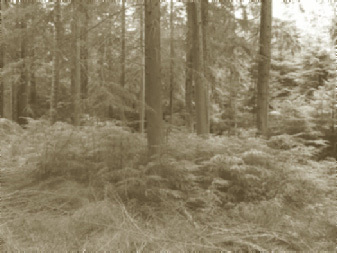 Part of the eastern area known as Old Wood was already woodland; the remaining area was established over the next 30 years, which quadrupled the original size. The current owners purchased the wood in 1986. The total area is 390 hectares, of which 326 are conifer, 32 broadleaves and 32 unplanted. Altitudes range from 91 to 200 metres. Average rainfall is 625 mm, which is supplemented by the ‘sea hags’, sea mists that regularly hang over the woodland, increasing the moisture and allowing many trees to survive and grow to large sizes similar to their native habitats, and an abundance of lichens usually associated with wetter climatic zones. Soils range from Boulder Clay, Fell Sandstone and Quartz Dolerite to the Scremerston coal group. Some of these soils overlie limestone. Old coal shafts are found in the wood and lime kilns once flourished nearby. 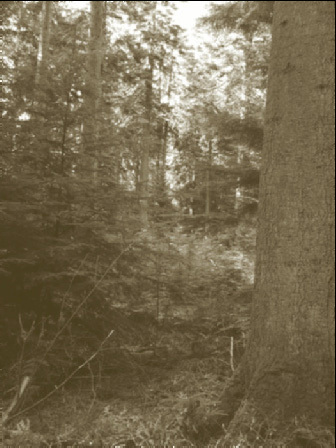 At one time over 146 species and varieties of conifer grew in normal forest conditions. Some of these have been lost to time and gales, plus considerable replanting during the 1940s. Now 16 conifer species are well represented plus a further 80–90 still growing on the site. The woodland has recently been designated as a Red Squirrel Conservation Reserve, to try to preserve this species. How long this will be sustainable with Grey Squirrels within 12 miles of the woodland, both to the north and south is debateable. Goshawks regularly breed in the wood, and Roe Deer are resident and common, with occasional Red and Fallow. Due to the range of soils, climatic conditions and uneven age structure a diverse range of flora and fauna are present. One third of the estate is managed under continuous cover forestry (CCF) principles, and although most clear fell areas are small, many are larger than the 0.25 ha maximum recognised under CCF guidelines. The management objectives are varied, taking into account the history where this is the only site in Europe in which many of the tree species are grown in forest conditions rather than parks or arboreta. Other considerations were landscape, areas of long term retention, nature reserves and particular micro climates such as rock faces and gullies. They can be summed up as ‘retain the status quo with the minimum of cost’. The day was attended by over 30 people from all three GB countries. It was led by Peter Hale the agent, Ian Robinson forest manager and Mark Yorke secretary to the CCFG, with other specialists speaking at various stops. The first stop set the tone for the day with much debate, interaction and varied experiences from the three different countries being shared. This highlighted the huge variance between the countries governed by different forest strategies, guidelines and grant aid. How, when, and was the stand suitable to start the conversion to CCF? Was the stand quality good enough to regenerate from in the future? Should crown or low thinning be used ? Was it already too late for the first intervention? Was it better, if stability was not compromised, to combine the first and second thinnings to make the operation more cost effective by being able to harvest larger dimension timber? Or was the first intervention, which is critical to stand development and future structure, too late at this stage ? Was the labour resource available to carry out ‘faller select’ operations, and was it possible to do this from a harvester in the low light conditions of dense unthinned stands? What sort of extraction was suited to these slopes? If transformed to CCF management is it realistic to expect that the larger more valuable timber eventually produced will subsidise the early interventions? Generally first interventions do not vary considerably between CCF and plantation forestry systems, line thinning access racks and or light interrack removal being the primary aim for both systems. For this stand this should be implemented sooner rather than later so that stability is not compromised, then all the other considerations can be addressed. Whether this operation would produce income, break even or make a loss was not clear! Deer control and damage by Hylobius arbietis (Large Pine Weevil) were discussed at the next stop, a clear fall and restock area on the east side of the forest overlooking the sea and Lindisfarne. Roe are controlled, Fallow and Red being seen only occasionally. 42 are culled annually, split 50/50 between bucks and does and concentrating on yearlings. If too many adults are removed this results in greater numbers of pregnancies and multiple births. Fencing is not used or deemed necessary, however lack of natural regeneration in some areas, particularly of Douglas Fir, is likely to be due to browsing, therefore a possible increase in numbers removed should be considered. This decision would be aided by erecting exclusion plots to assess browse levels. Control in CCF stands was sometimes made more difficult due to the lack of open space and this would need to be addressed as younger stands develop. Hylobius can kill or cause serious damage and reduced vigour to young trees, principally conifers, by totally or partially ring barking them. However this is rarely a problem in CCF stands, and increases with the size of the felling coup. It is generally accepted that this is because trees that are left standing act as hosts for the adults, whereas in clear cut sites the beetle breeds in the cut stumps and then feeds on the newly planted trees. One way around this is not to plant for the first year, which may be acceptable on poor sites, but on the better base rich soils rapid weed regrowth and colonisation may be a worse problem. Our next stop was in a magnificent stand of 1910 mixed conifers, including Corsican Pine, Douglas Fir, Western Hemlock, Red Cedar and Sitka Spruce with individual volumes of up to 5 m³. The owner was reluctant to intervene, however the lack of regeneration of the more light demanding species such as Douglas Fir was due to the high basal area [figures 1 and 2]. It was felt that up to 25% of the larger trees should be removed to increase suitable light conditions, help scarify the ground to aid regeneration and free the range of younger age classes already established. Western Hemlock and Red Cedar regenerated freely throughout most of the forest and may need to be controlled to favour the more valuable timber species. The marketing of large dimension conifer logs was discussed with local saw miller Andy Scott. Most sawmill investment has been, and still is, aimed at the high volumes of smaller diameter plantation Spruce established over the last 50–60 years. Therefore the capacity to handle large logs is limited and is more likely to be carried out by hardwood mills which have experience of milling both hardwood and softwood. However there is always a good market for large Douglas Fir. Andy quoted the following approximate value comparisons: Douglas Fir was four times the value of Corsican Pine and two to three times the value of Sitka Spruce at these dimensions. Large Hemlock, Red Cedar and other species, apart from Spruce, would most likely be milled down to smaller sizes anyway and therefore it was not necessary to grow to these large volumes. Pine at these sizes would be virtually unmarketable. 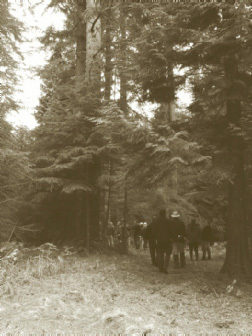 Although CCF tended to produce larger individual trees than plantation forestry, it was not necessary, for timber production, to produce such large logs as we were looking at.Therefore managing by target diameter felling was one way to ensure a marketable product for each individual species. The other specie in demand, particularly in Scotland, was European Larch but not Hybrid or Japanese which was of inferior quality and it was suggested planted only for amenity not timber production. We walked to the next stop through spectacular stands of mixed conifers, reminiscent of their native habitats in North America [figures 3 and 4]. Here several small groups of up to 0.4 ha of mixed conifers had been felled and replanted with Douglas Fir. Western Hemlock regeneration in some areas was sprayed out and other areas would be strictly controlled. We had a picnic lunch back at the old sawmill where we had started the day. Here Phillip Wilson of English Nature spoke about managing biodiversity in CCF stands and the importance of rides and open space. In the afternoon we travelled to the stops by car along the well roaded access routes. We walked into a stand of Western Hemlock [figure 5] approximately 50 years old with groups of younger regenerated Hemlock, which would be accepted within this compartment. Discussion centred on a handout showing the reverse J-curve of a transect taken through the stand identifying a range of diameter at breast height (dbh) measurements before and after the last intervention. The thinning was heavier where groups of natural regeneration existed, and the selected target diameter was between 25-35 cm. After the thinning the reverse Jcurve was much closer to the ideal than before. The value of this type of monitoring as well as assessing the number of seedlings (<130 cm tall) and saplings (>130cm) was debated. Research showed that there is a tendency to underestimate the number of seedlings and overestimate those of saplings. Although this sort of information is a very valuable management tool, the costs of recording and collating it are high. Under the previous Woodland Grant Scheme monies were available to assist with this monitoring, but are not now available in England under the new scheme. Re-spacing the Hemlock regeneration to 2 metres had taken place when the average height was 2-2.5 metres, but in hindsight it was felt this was too early as much of the Hemlock re-coppiced, or continued to grow because the plant was not cut off below the first branch whorl. Later experience from adjoining areas showed the optimum height would be 4-5 metres, or if left until 6 metres the extra costs may be defrayed by local markets taking some of the produce. Next we passed a stand of 60 year old Scots Pine growing on poorer soils with the ground flora predominantly Bilberry and Heather. The lack of weed competition had allowed impressive quantities of Sitka Spruce to regenerate naturally. The discussion centred on what to do next ? The consensus was that, subject to the soils being suitable, to thin the Scots, and depending on stability and light regimes, adopt a group selection system to allow the stand to develop. This would release the Sitka and eventually allow a change of species. Some Pines would be retained for landscape and biodiversity. In the light of earlier discussions on the different monetary values of the species and the fact that they were here for free only went to reinforce the change of direction. Larch planted in 1945, with very patchy 15-20 year old Larch regeneration beneath, was our penultimate stop. The area had previous windblow damage and the limited regeneration had probably established on the extraction routes. The stand was thinned 5 years ago to try to encourage further regeneration. The ground flora consists of dense bracken and grasses, so pigs were introduced to scarify the area. This was not successful due to too few animals, and supplementary feeding being carried out close to the fence, so any ground disturbance was limited to these feeding areas. If tried again, thinning should coincide with a good seed year, so that seedlings can establish prior to being swamped by weed growth. Pigs could be used again, but with an increase in numbers and fed across the site, and/or use chemical control on some of the more aggressive weed species. At our final stop Axel Wellpott a PhD student explained his experiments on measuring wind speeds and turbulence within two adjacent stand types. He will then compare these measurements with ones previously taken in a wind tunnel. Firstly a two storey stand of 25 metre Larch with an understorey of 10 metre Larch and Sitka Spruce, and secondly a similar stand with no understorey. Two 30 metre masts were erected in each plot with an array of instruments sited at different levels. Preliminary results show that low wind speeds within the stands are faster where there is no understorey, but as the speed increases they become faster in the stand with an understorey. It is planned to publish the results in 2007 as a FC Information Note. Thanks to our hosts for a most enjoyable and informative day and to the participants who shared a wealth of knowledge from all parts of Britain. Also thanks to Sharon Rodhouse for the use of her notes and Doug Earle-Mitchell for his photographs.